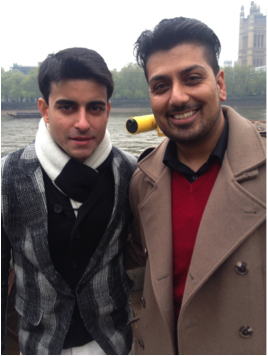 While fans of Star Plus’s hit soap Saraswatichandra scoured London streets in search of their favourite stars – Gautam Rode and Jennifer Singh Grover, Bradford based actor and Bollywood dancer Raj Parmar got the chance of a lifetime – not only to meet the actors but to show off his acting skills in the special UK scenes of the hit series. The multi-talented actor, choreographer and presenter on Sunrise Radio in Bradford, was most recently seen on TV screens across the UK, in Channel 4’s Big Ballet with legendary dancer Wayne Sleep. Parmar, who beat 500 hopefuls for a much-coveted spot in the documentary, landed one of the lead roles as heinous villain Baron Von Rothbart in Tchaikovsky’s Swan Lake. In a troupe of 18 plus-size dancers, Raj stood out as one of the two male dancers and the only Asian in the group. However, as well as dancing, acting and Indian soaps are Raj’s great passions, and when he found out about the soap filming on location in the UK, his drive and commitment to get a part in one of India’s most successful dramas took over and he pursued his goal with dogged determination landing a small role alongside the great India soap stars. Playing the role of a souvenir shop owner, Raj’s character plays a vital role in the search for Kabir as the show characters ‘Saras’ and ‘Kumud’ approach him for a vital clue that direct them to… a location that for now remains a closely guarded secret!